Each year the Medical College of Wisconsin Center for Patient Care and Outcomes Research hosts a year-end luncheon meeting for its faculty and staff. To demonstrate appreciation, each individual receives a gift. In the past, the Center has given fleece sweatshirts and gym bags that were imprinted with their logo. In 2014, they were ready to find something new and different. Tammy Hosch, Administrative Coordinator, was looking for creative ideas from promotional marketing companies. She first heard about Magellan Promotions through her husband, who works for AIDS Resource Center of Wisconsin, also a client of ours. She met with us to describe her Center’s project needs: a reasonably priced, good quality and unique item that all will enjoy. The process of selecting and creating the Bluetooth speaker was especially easy, according to Tammy. She felt that the account managers, “really listened and cared about what we were doing,” and was very happy with the project coordination and communication throughout. “Everything was spot-on just as I needed it to be. They thought of things that needed to be considered before I did, so it made my job easy,” she added. The Pieladium is a pie-shaped Bluetooth speaker that “shares a slice of your music taste with the world.” It even comes individually packaged in a pizza shaped box! Listeners can enjoy up to 10 hours of stereo quality sound from up to 33 feet away from the speaker. When synched with a Bluetooth mobile phone, the Pieladium can be used for conference calls. The lithium-ion battery can easily be re-charged to keep the music playing! It is compatible with mobile phones, tablets and laptops with Bluetooth technology. A logo can be imprinted full color on both sides of the speaker. 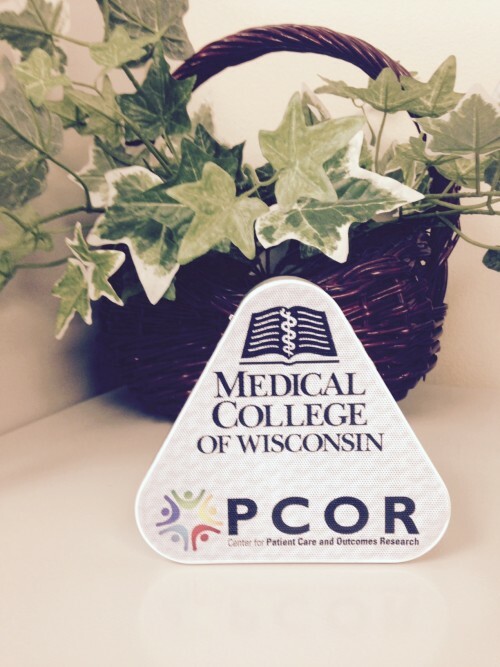 The generous imprint area of 4.5″x 4″ was an ideal canvas for the Medical College of Wisconsin Patient Care and Outcomes Research logo. The faculty and staff loved the Pieladium Bluetooth Speaker! The cool packaging made it easy for them to figure out what it was. The speakers can now be seen throughout the department on desks. The feedback was so positive that another department on campus decided to order their own Bluetooth speakers for their employees too!